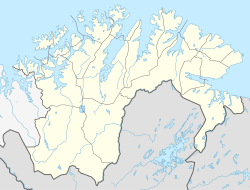 Lakselv (help·info) (Northern Sami: Leavdnja; Kven: Lemmijoki) is the largest village and administrative centre of Porsanger Municipality in Finnmark county, Norway. The village lies at the southern end of the large Porsangerfjorden. The 2.3-square-kilometre (570-acre) village has a population (2017) of 2,283 which gives the village a population density of 993 inhabitants per square kilometre (2,570/sq mi). There are a number of shops and supermarkets in Lakselv, as well as private and public sector services that cater for the village and its surrounding settlements. Lakselv Church is located in the center part of the village. The European route E06 highway runs through the village. Lakselv Airport, Banak is located in Lakselv on the Banak peninsula. The airport has connections to Tromsø, Alta and Kirkenes operated by Widerøe, as well as charter flights in the summer season. The area is popular for salmon, trout, Arctic char, and grayling fishing throughout the summer months in the Lakselva river which runs through the village. There are also great hiking opportunities in the surrounding arctic wilderness, including in Stabbursdalen National Park just west of the village. During the winter, skiing, snowmobile safaris, ice fishing, and dog sledding are popular activities, there are a number of lit skiing tracks available in the area. ^ "Lakselv" (in Norwegian). yr.no. Retrieved 2013-03-28. ^ Store norske leksikon. "Lakselv" (in Norwegian). Retrieved 2013-03-28. Wikivoyage has a travel guide for Lakselv. This page was last edited on 21 November 2018, at 17:35 (UTC).